The aim of this paper is to draw the attention of my brethren to a Masonic item which hardly ever attracts any questions as to its origin, namely the rosette or multiples thereof, found on the Masonic apron and by whose design our place is distinguished on the Masonic ladder. It is this design on the apron which, not only, determines if we are properly dressed for lodge, but also to which level of attendance we should be in a working lodge. Entered Apprentice: a plain white lamb skin 14 to 16 inches wide, 12 to 14 inches deep, square at bottom, and without ornament; white strings. No rosette. Fellow Craft: a plain white lamb skin, similar to the, entered apprentice, with the addition only of two blue rosettes at the bottom of the apron. Master Mason: the same, with blue lining and edging, 1 1/2 inch deep, and an additional rosette on the fall or flap.-No other colour or ornament shall be allowed except to officers and past officers of the lodges, who, may have the emblems of their offices in silver or white in the centre of the apron. Rosettes also appear in the Scottish Rite system [Lodges of Perfection] - see later. The origin of rosettes on the F.C. and M.M. aprons is, believe it or not, unknown. In England they were a comparatively late introduction, and were not prescribed officially until 1815, when they were specifically designed to differentiate the three grades. It is probable, however, that their original purpose was purely ornamental. However, there is extant a German Masonic medal or jewel, from mid 18th century, which shows an apron with three rosettes. Unfortunately, there is no trace of a Grand Lodge during this period, either English or European, which prescribed the use of rosettes, and in the circumstances one is compelled to assume that they were purely decorative. This does not exclude the possibility that they may have had a more practical significance in the Lodges in which they were worn but a likely suggestion is that they were adopted then as a means of distinguishing the grades of Brethren. The love of ornamentation was possibly another factor as will be seen later. First let us define today's understanding of what may be considered a Rosette with examples. Then my intention is, I hope, to inform you as to how the worn rosette entered public life in general and how it may have arrived into Masonic tradition in particular. Comment will also be made on the other decorative elements, tassels and Taus [levels], to be found on the apron as they seem to have been adapted into regular usage from about the same period. I shall be discussing mythology, astrology, Phoenician and Classical Greek art motifs, chivalry, Masonic philosophy and symbolism, botany and linguistics, both of which are heavily influenced by the Hebrew language and the world of colour and culture. Rosettes are also sometimes called bowknots, due to their shape. From the latter definition let me expound on "Worn as a badge of office, as evidence of having won…"
dignity, the affiliations or associations of your life. They are an enduring symbol of pride and achievement. Obviously I shall end this paper in reference to Masonry but first and foremost we all know that one of the better known applications of this is within the Chivalric Orders where a civilian may wear the rosette only as a boutonniere. This is a small round lapel button covered with the colours of the Order. A cloth or metal bar of different ribbons may be worn at the same time BUT only one rosette may be worn. 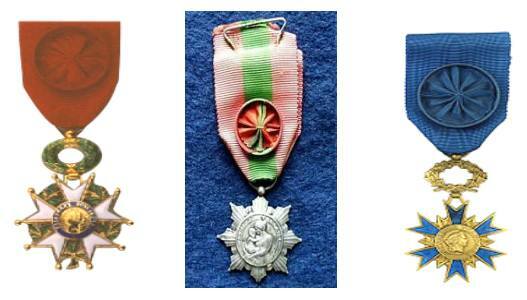 In the United States, the only medal today currently issued with a rosette is the Medal of Honour. The rosette is authorized for civilian wear. The rosette is presented with the Medal of Honor neck ribbon and ribbon bar at the same time. In times past, the Purple Heart was also presented with a rosette, but now has been replaced by a metallic lapel pin. On May 2, 1895 Congress authorized "a rosette or knot to be worn in lieu of the medal and a ribbon to be worn with the medal." 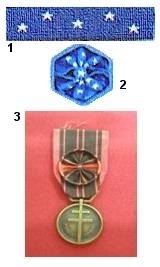 Today's Medal of Honor Ribbon is blue with FIVE stars, 2 at the top and 3 at the bottom. (One of the most common mistakes people make when displaying Medal of Honor graphics is to display the ribbon up-side down. 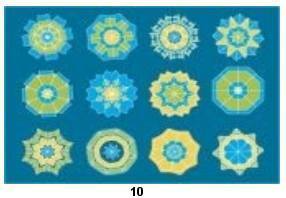 )The six-sided blue silk rosette bears 13 stars and is worn on civilian attire. Medal of Honor recipients also wear the Medal itself around the neck of civilian attire for special occasions. The lapel pin is designed to be a smaller version of the ribbon bar, also for use on civilian wear. The image 3 is an example of the USA National Defence Service Medal with rosette. Several of the top decorations of France, including the Légion d'honneur  , La Patrie Reconaisance Honneur Medal  and the Ordre national du Mérite,  are presented with a rosette along with the medal. The Legion of Honor authorized a rosette for those who have the rank of officer or above. If the grade is higher, the rosette is adorned with gold and/or silver bars (or "half-knots") which are place beside each side of the rosette. The officer wears the badge on a ribbon with rosette on his left chest. Award ribbons can be simply a flat piece of ribbon, a flat-folded ribbon, or fancier manipulations of the ribbon material, such as rosettes. A rosette consists of ribbon that is pleated or gathered and arranged in a circle so that it resembles a rose, usually with streamer ribbons attached. The single rosette is the most basic motif of hex signs and it is one of the most ancient designs in western culture. The rosette appears on buildings, furniture, gravestones and pottery. The rosette design is a symbol for luck and the scalloped border symbolizes smooth sailing. The color red is used to symbolize strength and green is a life color. This sign with the red rosette is a potent safeguard against harm and portends good luck in life. I wish to discuss ancient Jewish literature as our starting point in this paper because Hebrew is a very ancient , if not the original source language for other languages, and it may be wise to peruse the linguistic influence on the word we are about to discuss. Before I enter the world of linguistics I wish to embellish the word rosette with its major component, namely the word ROSE, for a rosette is nothing more than a diminutive of rose, as seen from the dictionaries above. Also please bear in mind not only the shape of such a flower but its coloration as we know it today. In the Jewish world of celebration, one month before Passover, the story of Esther and Mordechai [Purim] in ancient Iran is recited, and in the prayers following, the phrase שושנת יעקב 'shoshanat yaakov' is mentioned. Literally this means "rose of Jacob". But other translations have "lily of Jacob". So is it a rose or a lily? Does it matter? Are they related? In referring to dictionaries it becomes more interesting. Some scholars identify shoshan with the lotus and ranunculus. [Related to Aramaic שושנתא (whence Ugaritic twt, Arabic sausan, Vulgar Arabic susan), Akkadian sheshanu (= lily), Syriac shishno (= butomus flowers). Note the influence of the worldly shesh meaning a reference to the number six in several languages. One famous Hebrew commentator, Ibn Ezra, connects shoshana to shesh in his commentary on Shir HaShirim [ Song of Songs] 2:2 stating "It is a white flower of sweet but narcotic perfume, and it receives its name because the flower has, in every case, six [shesh] petals, within which are six long filaments." See picture 12. So if a fairly modern day commentary on the biblical shoshan(a) indicates very strong preferences to the lily, when did it become associated with the rose? Of interest I would like to point out that the symbolism of the lily has passed from the Jews to the Christians, so that the angel of the Annunciation is conventionally represented as bearing lilies without filaments. But prior to this period the diminutive rose, the rosette, has been a symbol associated with many Goddesses, but it is especially sacred to Inanna, Ishtar and Astarte. Some scholars think that the Rosette is a symbol for the star of Venus. The Rosette is the "Star of the Earth" and grows up from the underworld beneath the ground. It is the Earth's star, as Venus is the star of the heavens. Many carved rosettes have survived, they vary widely in their patterns, but all are clearly representations of the rosette. Targum Onkelos to Exodus 25:31-34 and Deuteronomy 8:4 there are examples of perach being translated as shoshana. This seeming inaccuracy is explained by the generic term of shoshan which might have included such flowers as the lotus [see later] and even the rose. In fact, the Midrash [a compilation of homiletic teachings (commentaries) on the Tanakh (Hebrew Bible)], contains a few passages which speak of a soft lily, and the choicest of this kind is the lily of the valley, paralleling the rose of the valley. Besides these allusions, the Midrash specifically mentions a shoshanah shel wered -a lily-rose - which grows in orchards, which is also the symbol of Israel. This indicates that the shoshana shel vered שושנה של ורד was a subset of the more generic shoshana. Now we come to a word familiar to all modern Hebraists, namely vered ורד. Notice that there is no verse in the Hebrew writings stating definitively the colour of the shoshana or shoshan mentioned - leaving room for it to be either the white lily or the red rose. Rashi [a well known biblical commentator] in particular reinforced the identification of shoshana with the rose in his commentary on Shir HaShirim 2:2, [Song of Songs] where he describes it as always remaining red (although he doesn't mention the word rose or vered.) The kabbalistic book of Zohar also identifies the shoshana as a rose. From a human point of view it is interesting to note that female immigrants to Israel from Europe with names related to Rose - Raisel, Rosa, etc often changed their names and generally adopted the name Shoshana. So while vered was still known to be "rose", we can assume that it was more of a technical term, and less of a popular one. However, today the name Vered is also quite popular - probably because the flower rose is generally and more popularly known as vered. Which translation is right? We now live in a scientific age, where every plant and animal is classified and sub-classified into genus and species. So we could expect that the Hebrew names should reflect that level of precision. But the ancients weren't as concerned with that level of detail as we are today, and therefore shoshana could refer to a number of different flowers - even those fairly distantly related botanically - as mentioned above, to the extent that lily and rose became interchangeable. At this point I wish to elaborate on the Egyptian 'sesen' or the Coptic shoshen i.e. the lotus. The Lotus is not a separate genus. In fact it is THE lily family and a short discussion of this flower ensues. Water lilies encompass 5 species of Lotuses, three in the genus Nymphaea and two in Nelumbo; both genera are members of the water-lily family, Nymphaea lotus, and the Egyptian white lotus is believed to be the original sacred lotus of ancient Egypt. It and the Egyptian blue lotus, N. caerulea, were often pictured in ancient Egyptian art. The common Egyptian "lotus" is actually correctly called a water lily: the white lotus [right below] opens at dusk; the blue water lily opens in the morning. The white lotus [left below] is a shallow-water, night-blooming plant with a creeping rootstock (rhizome) that sends up long-stalked, nearly circular, dark green leathery leaves, which float on the surface. The flowers, up to 25 cm (10 in) across, remain open until midday. The blue lotus [centre] is a smaller, less showy day-blooming plant. The Lotus flower has for thousands of years symbolized spiritual enlightenment. Indeed, this flower essence's purpose is to accelerate spiritual evolvement and enhance healing on every level within the system. The blue lotus was native to the Nile and used to be abundant. Its narrow, pointed petals and round, spotted leaves appear as the more common lotus in every conceivable opportunity for Egyptian artistic imagery. And more than often the leaf and spots are not shown. The Rosette has been a symbol associated with many Goddesses, but it is especially sacred to Inanna, Ishtar and Astarte. Some scholars have concluded that the Rosette is a symbol for the star of Venus. The Rosette is the "Star of the Earth" and grows up from the underworld beneath the ground. It is the Earth's star, as Venus is the star of the heavens. Many carved rosettes have survived, they vary widely in their patterns, but all are clearly representations of the rosette. The rosette is also considered to have royal symbolism. The lotus is a very important flower for Eastern civilizations. The Hindus believed that Brahma, their creator god, was born from a golden lotus [see fig. 14] and so the flower is often associated with the spirit being elevated from one realm to another. The lotus flower appeared in legends originating from ancient Egypt. It played an important part in ancient Egyptian religion. The pure white lotus flower, the only plant to fruit and flower simultaneously, emerges from the depths of the muddy swamp. Growing from the mud at the bottom of ponds and streams, the exquisite Lotus flower rises above the water and is usually white or pink with 15 or more oval, spreading petals, and a peculiar, flat seedcase at its center. Sesen: A Lotus Flower. This is a symbol of the sun, of creation and rebirth. Why? Because at night the flower closes and sinks underwater, and at dawn it rises and opens again. According to one creation myth it was a giant lotus which first rose out of the watery chaos at the beginning of time. From this giant lotus the sun itself rose on the first day. A symbol of Upper Egypt. The lotus flower played a prominent role in the version of the creation story that originated in Heliopolis. Before the universe came into being, there was an infinite ocean of inert water which constituted the primeval being named Nun. Out of Nun emerged a lotus flower, together with a single mound of dry land. The lotus blossoms opened, and out stepped the self-created sun god, Atum, as a child. In another version originating in Hermopolis, the sun god who formed himself from the chaos of Nun emerged from the lotus petals as Ra. The lotus is a flower which opens and closes each day. His history went on to say that the petals of the lotus blossom enfolded him when he returned to it each night. The lotus flower has been featured extensively throughout the art of ancient Egypt. In various works of art, you may see it held in the hand of a god or human, serving as a border to outline a section of the artwork, unfolding to reveal various gods or humans, and many other depictions. The ancient Egyptians from the 4th dynasty greatly valued the sacred lotus, in religious ceremonies and funerals. To the ancient Egyptians the symbol of three sacred lotus lilies represented "plant" meaning Tree of Life". They have tree stems curving to the left as though blown into Life by the breath of Hu, the Celestial Sphinx. On top of each stem is the Lotus flower [fig.15] which was used in Ancient Egypt to represent Life and Resurrection. It is from this hieroglyph that the French "fleur de lis" [fig.16] traces its origin. The "fleur de lis" represents the Tree of Life. The glyph which denotes the sacred knowledge associated with Hu is also formed by the three stems of the three sacred lotus lilies. The Osiris Crown can be similarly considered in these terms. But Edward was not the first. Crusaders introduced lilies into European Christian art; because of its association with the Crusaders, the lily came to stand for chivalry, and the French nobility adopted the fleur-de-lis as its symbol. The motif was first used by King Philip I (1052-1108) of France in the 11th century. The 'Lilies' are said not to have appeared in the French arms until the time of Philip Augustus (1165-1223). In Christian symbolism, the fleur-de-lis is used as a symbol of the Holy Trinity and as an ensign of the Virgin Mary, mimicking the rose. The ancient Egyptians developed the art of counting to a high degree, but their system of numeration was very crude. For example, the number 1,000 was symbolized by a picture of a lotus flower, and the number 2,000 was symbolized by a picture of two lotus flowers growing out of a bush. Hindus associate the lotus blossom with creation mythology, and with the gods Vishnu, Brahma, and Lakshmi. From ancient times the lotus has been a divine symbol in Hindu tradition. The growth of its pure beauty from the mud of its origin holds a benign spiritual promise. Borrowing from Hinduism, in Buddhist symbolism, the lotus represents purity of body, speech, and mind, floating above the muddy waters of attachment and desire. The Buddha is often depicted sitting on a giant lotus leaf or blossom, as seen above. The rose is the traditional flower of lover and romance since the Victorian era. The praise of roses goes back to ancient times and across many civilizations. A Roman legend claims that this flower received its color when Jupiter caught Venus bathing and a white rose turned red in her reflection. The Greeks believed that red roses sprang forth from the ground where Adonis and Aphrodite spilled their blood. By Christian times, the red of the rose had come to also symbolize the blood of martyrs, the rose itself being a symbol of the Virgin Mary, the 'Mystic' rose. The rose is the national flower of England and the United States, as well as being the symbol of England Rugby, and of the Rugby Football Union. It is also the provincial flower of Yorkshire and Lancashire in England (the white rose and red rose respectively), of Alberta (the wild rose) in Canada, and of Islamabad Capital Territory in Pakistan. It is the state flower of four US states: Iowa and North Dakota (R. arkansana), Georgia (R. laevigata), and New York (Rosa generally). Portland, Oregon counts "City of Roses" among its nicknames, and holds an annual Rose Festival. The Greek island of Rhodes is known as the Island of Roses or Rose of the Aegean, but does not use the rose as its symbol. More recently, from the last century [Paris 1968] a red rose (often held in a hand) became a symbol of socialism or social democracy: it is used as a symbol by British, Irish, French, Spanish, Portuguese, Norwegian, Danish, Swedish, Finnish, Brazilian, Dutch and other European labor, socialist or social democratic parties. The White Rose was a World War II non violent resistance group in Germany. Eight-petalled rosettes (see fig.19) can be found on various ancient game boards as well as on many other objects. They were generally a symbol for the sun, or more precisely its cycle of birth, death, and rebirth, and so indicated the passages from one state of existence into another. We know that the eight-leaf rosette was also the emblem of the fertility in Mesopotamia goddess Ishtar and her planet Venus. In a well-known myth, Ishtar descended into the underworld and was held there as dead before she returned to life and to life-giving, just as Venus the evening star disappears from the sky for some time and then heralds as morning star the return of the life-giving light. The symbolism is the same as that derived from the cycles of the sun. A tentative astrological connection can be noted as follows bearing in mind the number eight. Venus and the sun also both match the eight leaves of the rosette with their observable behaviors. Venus disappears for an average of eight days in the glare of the sun during its transition from evening to morning star. Furthermore, five complete Venus cycles of 583.92 days each come close to eight solar years of 365.2422-days each, and they match them exactly, at 2920 days, when both periods are rounded to whole numbers. In general, the contexts in which we find the eight-leaf rosette suggest that it represented the birth, death, and rebirth of the sun (and/or of the planet Venus), in many of the ancient Near Eastern religions which could have influenced the maker of the Disk. So What is the Relevance of Rosettes in Freemasonry Today? I have my own thoughts as to the time of introduction but I shall leave that till the end of the article as there are some loose knots to tie. A simple explanation could be that the three rosettes are to remind you of the three that rule a Lodge. A deeper symbolic meaning to the aprons may be applied as follows: The Entered Apprentice wears a white lambskin without any ornamentation or color, typifying innocence in his first hour of sacrifice when he dedicates himself to a way of life where honor and fidelity, purity and integrity are the mainsprings of his words and actions. White is ever present on the Freemason's apron. step has been taken in the journey. Then when he becomes a Master Mason, another blue rosette is placed upon the flap, showing a triangle symbolizing the Divine Triangle, the Great Symbol of the number three, which pervades all natural law and is found everywhere in human history, as representative of three in one, "The Divine Trinity." or the "triune" essence of the Divine Name - I was, I am and I will be. The compasses and square that are placed in the rosettes show that he is a skilled workman. When he is installed Master of a Lodge, the rosettes are removed and levels [taus] take their places, showing that he is foreman or overseer of the work and can prove the various parts of the building by the level. However contrary to what has been freely written upon the subject, it is difficult to see how any symbolical meaning could originally have been attached to them. Indeed the origin of rosettes on a Masonic apron probably cannot be discussed without taking into consideration the general composition of a Masonic apron i.e. including the tassels and higher grade ornamentation. For example Past Masters of English Constitution lodges have a different apron. Instead of rosettes, there are three Levels placed in the same position. Perhaps the earliest reference to apron levels is in an order of the United Grand Lodge of England in 1814, describing how the levels are to be placed on the Aprons. They were originally made from ribbon. Examples of the earliest aprons with rosettes in the Museum and Library of Grand Lodge at Freemasons' Hall [London] are of late 17th Century, and with levels from about 1800. It was the speculative masons, in the middle to late 18th Century, who at some point began to decorate their aprons with designs, usually painted by the owner's own hand, with Indian ink, paint and embroidery, as he saw fit. As a result, many of these designs included detailed symbolism of all the Craft degrees as well as the Mark, Chapter and Ark Mariner. See fig. 20-21 of such aprons illustrating any combination of Masonic symbols. Because the apron had become a bewildering combination of patterns, sizes, and decorative styles by the adoption of purely Masonic symbolic decorations, the United Grand Lodge in 1815 made it a duty to simplify the apron insisting on a uniform pattern. However a generation went by before there was complete uniformity and conformity to certain standards. The symbolical explanations which are virtually standardized in the modern rituals are clear, simple and wholly satisfying. However I must stress that it is the unchallenged right of every Mason to seek further afield for the interpretations that will fulfill his spiritual needs. As aforementioned the introduction of rosettes also influenced the nature of the apron. Before a short discussion on the apron to which the rosettes are attached I think it wise at his point to elaborate on three important words: Symbol, Emblem and Badge. Let us define what is meant by each. An idea, sign, device or object which has within itself something else ; an idea, or fact, even a proposition - which it guards from facile scrutiny, but which it may yield, if it be studied. Some symbols are simple, others very complex. In Freemasonry, certain symbols denote somewhat vaguely certain "virtues" or "facts', while others are capable of a wide interpretation. accepted by common agreement: e.g., a crown means royalty, white means purity. membership of any corporate body serving its owner to establish his identity, as indeed his own name does. That the apron is a 'badge' is without question. apart from artistic forms or embellishments? The Masonic apron varies according to the constitutions. For example, the Dutch wear an apron bordered with black and with skull and crossbones on the flap. Scottish lodges each have their individual right to choose the design, colour and shape of their aprons; some employ a tartan, while many others have a circular rather than a triangular flap. This is the reason why all four Scottish lodges dress in different regalia whilst all English lodges have adopted the same model. Irish aprons appear to be a bizarre attempt at standardization with tinges of individualisation in the apron borders and embroidery. The colour of the Master Mason's apron, which is that of Cambridge University, and likewise that used by Parliament when fighting King Charles, has a much deeper significance than is generally known. It is closely related to the colour of the Virgin Mary, which in itself has been brought forward from Isis, Astarte and other Mother Goddesses of the ancient world, whose symbol was always the moon and seven stars. You may have noticed that many statues of the Virgin Mary show her wearing a diadem or crown of seven stars on her head and her cloak is light blue, the colour of the English Constitution Masonic apron. In contrast, the aprons of District and Grand Lodge Officers have Garter Blue, often connected with certain Orders of Knighthood, but note that this blue is the colour of Oxford University, and the colour associated with the Royalist cause during the Civil War. Thus the two aprons in use amongst Brethren of the English craft employ the colours of the two great Universities of England. The dark blue colour [which I wear as we practice a South African- modified Dutch ritual which had evolved from the Rites Francaise, operating in Israel under Scottish Rite with special dispensation from the Grand Lodge of the State of Israel] therefore can be said to represent the rulers in the Craft, and represent the masculine element. Light blue, on the other hand, represents the feminine or passive aspect, and is most appropriate for the ordinary Master Mason, whose duty it is to obey and not to command. The other significant emblems representative of the female aspect are the three rosettes, symbol of the rose itself and itself a well known substitute for the Virgin Mary herself as the Mystic Rose, as aforementioned. The three rosettes on a Master Mason's apron are arranged so as to form a triangle with the point upwards, interpenetrating the triangle formed by the flap on the apron, alluding to the square and compass. The two rosettes on a Fellow Crafts apron stress the dual nature of man and could have a clear reference to the two Pillars. The two rosettes also point out that the Fellow Craft has not yet a complete Freemason as it requires a third rosette to form a triangle. The Fellow Craft's apron thus represents the wearer's status as being superior to an Entered Apprentice but inferior to that which in due time he will attain and which the third rosette will invariably complete in the form of the interlaced square and compass. As the Master Mason advances and becomes Master of his Lodge, the rosettes of his apron give way to three Tau or levels as they are generally called. Before discussing the Tau, a short word about the appearance of the rosette in Scottish Rite masonry, the Lodges of Perfection, is apt. The 18th Degree in Scottish Rite masonry is the Rose Croix Chapter and is essentially an intrinsic Christian degree and as such, based upon which I have already mentioned, utilises the rose as its main emblem. In Israel the degree has been modified to permit our Jewish brethren to advance the Perfection ladder, and rightly so. Some say that the rose in Kabbalistic Judaism also represents the Garden of Eden and the expulsion wherefrom of Adam and Eve. This beautiful image of the Hermetic Rose Cross (fig.23), obtained with grateful thanks from the Hermetic Fellowship, will clearly show to anyone familiar with the common colour attributions of the Kabbalistic Tree of Life how closely related are the disciplines of Kabbalah and Rosicrucianism.The apparent central rosette is actually 'bricks' of Hebrew letters. 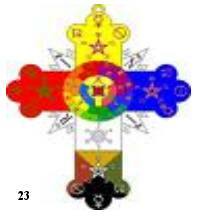 The four arms of the cross represent fire [red],water[blue], air[yellow] and earth[colour mixture].The 4*3 =12 prominences symbolise the twelve planetary signs. Below is an example of The Cross of Kabbalah and two illustrations of the kabbalistic tree of life. They too are composed of lookalike rosettes. In its opening discourse, the Holy Zohar explains how the Shechina (otherwise known as the Divine Presence, referred to as Knesset Yisrael, the "Community of Israel") is compared to a rose that has the two colors, white and red, within it. In addition, the rose has thirteen petals and five sepals surrounding her to protect from the thorns. Similarly, the Shechina possesses two general qualities: loving kindness and judgment corresponding to white and red, respectively. So in the same manner is the lily which sits upon 5 sepals - resembling the 5 fingers. And this lily corresponds to the goblet of blessing. We have already made mention of the word 'sub-rosa' - keeping a secret. This is very relevant in Freemasonry. How did this arise? It would appear that the whole is based on the mythological Horus. Horus is the Falcon headed god of ancient Egyptian mythology. Like many other gods the nature of what he was and the legends and stories that went with him changed over the course of history. Horus was an amalgamation of other, related deities, all of whom where sun gods and associated with the royal prerogative and the sky. Because Horus was a combination of other gods, it is rarely correct to refer to "Horus" as Horus was as much a family of related deities (though many had differing parentages) unified in one being; something similar occurs in many Christians' interpretation of the one God who manifests in three parts. Heru-ur (also called Harmerti) is the oldest version of Horus, and was a falcon creator-god who was known for restraining Apep. His eyes were the sun and the moon; during a new moon, he was blind and was called Mekhenty-er-irty ("he who has no eyes") and open the return of his sight, he was called Khenty-irty ("he who has eyes"). As a child, Horus was called Har-pa-khered ("Horus the child" and called Harpocrates by the Greeks) and was a son of either Osiris and Isis or Banebdjetet and Hatmehit. He was depicted as a naked boy with a finger in his mouth, sitting on a lotus with his mother. In this form, he was a fertility god and was depicted with a cornucopia. Aphrodite gave a rose to her son Eros, the god of love; he, in turn, gave it to Harpocrates, the god of silence, to ensure that his mother's indiscretions (or those of the gods in general, in other accounts) were kept under wraps. Paintings of roses on the ceilings of Roman banquet rooms were also a reminder that things said under the influence of wine (sub vino) should also remain sub rosa. In Christian symbology the phrase "sub rosa" has a special place in confessions. Pictures of file-leaved roses were often carved on confessionals, indicating that the conversations will maintain secrecy. The phrase has also understood to make reference to the mysterious virginal conception of Christ, which will remain a secret to a rational mind. More recently, "sub rosa" activities have become a byword for covert operations, usually by security services. Originating primarily in the Canada and the USA Special Forces, this meaning has been gradually spreading to other countries and in particular the United Kingdom. Har-pa-Khered became very popular during the time of the Roman Empire, when he was depicted riding a goose or ram (note Banebdjetet, his father, was a ram god). At this point I would like to add an observation of my own which I have never seen recorded elsewhere. Under the history of Egyptian mythology I discussed the symbol of the three sacred lotus lilies representing "plant" meaning "Tree of Life". Another picture of the Osiris Crown and hieroglyphics will help explain my thoughts. If one looks carefully at the glyph there is an uncanny resemblance to the Hebrew letter 'SHIN' pronounced 'SH'; and as we know 'SH' [ or 'shush'] is the sound made by the human when requesting silence, invariably placing the finger to ones lips at the same time! In Hebraic literature the Rabbis [especially the famed Chofetz Chaim, Rabbi Yisrael Meir Kagan, born 1839 ] placed great stress on NOT gossiping, implying 'silence is golden'. The Vilna Gaon quotes a Midrash saying that for every instant that a person holds his silence he will receive the highest rewards. In effect silence will guarantee one a 'long life' because often it is the spoken word which causes the human the most pain. I suspect that this is a coincidental observation but nevertheless a very important one. I make mention of this as a 'figure of silence' is used in the initiation ritual of our South African- modified Nederlandic ritual. The Tau is the symbol of the Creator and also the symbol of the Royal Arch. At one time all Masters had to be exalted to that supreme degree before he could accept the Chair in a Craft lodge. Now a short word about another important feature of the apron, namely the tassels, which originally represented the ends of the string used to tie the apron round the waist. It was only a matter of time before these strings were decorated with tassels and even today certain aprons, such as those worn by members of the Royal Order of Scotland use this type of string with ornamental tassels which when properly tied together at the front cause the two tassels to stick out from under the flap. Craft aprons have now replaced the string or cord with a band attached to a hook and eye and so tassels have been replaced by two strips of ribbon on which are attached seven chains. The seven chains themselves are full of symbolic meaning and represent various Masonic allegories such as the seven liberal Arts and Sciences; the number of Masons needed to form a perfect lodge and the number of years it took King Solomon to build the temple, etc. The two ribbons and chains might also be representative of the old pillars that used to adorn the apron before these were replaced with the existing form. Finally we arrive at the band with the hook and eye attachment that perhaps nobody may be aware is also full of symbolic significance. It is no accident that the snake was selected for this purpose. The snake is the traditional symbol of evil, but it is also associated with wisdom. Thus the serpent in our apron denotes that we are encircled by Holy wisdom. You will also notice that the serpent is biting its own tail, thus forming a circle which has always been regarded as the emblem of eternity, and more especially the Eternal Wisdom of God. I would like to state at this juncture that it is my belief that the rosette entered Freemasonry as a direct result of the passionate love by the French for rosettes adorned to indicate status. I refer back to their medals. No one else uses them the way they do, past or present. As an award, their Medal of Honor has existed since the days of Louis XIV. In addition, we see the influence of the fleur-de-lis, as aforementioned, in early coats of arms e.g. Paris, which dates back to 1358, (see fig. 26) and in association with French monarchy from early times. In addition we also know that in 1797, the first Chapter of Rose Croix was formed in New York City by a group of Frenchmen. In other words I believe that it was the French who influenced the British. We know that there was a marked two-way traffic of masons from the 18th and 19th centuries from England to mainland Europe. Brethren, I hope I have been able to clarify some of the background to the nature of what is referred to as a rosette and at the same time show how it adds to the symbolism of the apron. The apron is an important piece of regalia which happens to be, by virtue of the rosette and tassels etc decorative and colourful. Indeed the apron is a vital part of our ritual and any Mason who is not wearing his Masonic apron in a lodge is considered quite rightly to be improperly dressed. Thus we accept that our apron is a very honourable garment, one that we should treasure. It is an apron made of lambskin, pure white, without fault or stain - the colour of the Soul as mortal man sees it. It is ours and it now depends upon each of us to keep it without blemish - to keep it as a mirror of our behaviour that we may stand the final test when we reach that spiritual edifice - not built by hand, eternal in the Heavens. c] Masonic article by Leonard Morris PGM, Canada, 1934.